American Football League (1960–1969) National Football League (1970–present) The New England Patriots are a professional American football team based in the Greater Boston area. The Patriots compete in the National Football League (NFL) as a member club of the league's American Football Conference (AFC) East division. The team plays its home games at Gillette Stadium in the town of Foxborough, Massachusetts, which is located 21 miles (34 km) southwest of downtown Boston, Massachusetts and 20 miles (32 km) northeast of downtown Providence, Rhode Island. The Patriots are also headquartered at Gillette Stadium. The Patriots and the Bills were both charter members of the AFL, and even competed with each other in an AFL playoff game. They have remained divisional rivals since the NFL-AFL merger. Prior to the rise of Tom Brady, the two teams shared a mellow, yet occasionally competitive rivalry, featuring highlights from players such as O.J. Simpson, Steve Grogan, Joe Ferguson, Jim Kelly, and Drew Bledsoe. 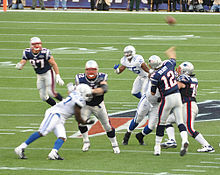 However, Brady has dominated the Bills ever since taking over as the Patriots' franchise quarterback, holding a 26-3 regular season record over them. Though Patriots fans usually feel apathetic towards the Bills, Bills fans have come to despise the Patriots more than any other rival. The rivalry has remained somewhat intense in recent years with multiple players having played for both teams, the Bills usually giving their all when playing the Patriots, and the presence of Rex Ryan, who coached both the Bills and Jets and was known for his trash-talk. As of 2018, Tom Brady is the winningest quarterback in the Buffalo Bills' New Era Field since 2001, amassing 15 wins and beating out 18 Bills quarterbacks that have started for the Bills in that timespan. The next winningest quarterback is Drew Bledsoe, who played for the Bills from 2002-04 and amassed 14 wins at the Bills Stadium. Brady also boasts a 29-3 record against the AFC East rival. The Patriots first played the Miami Dolphins in 1966 in the AFL, when Miami was one of two expansion teams to debut that year in that league. The Dolphins dominated the Patriots in the 1970s and 1990s, but the two teams remained competitive with each other for years before the rise of Tom Brady. Brady, however, struggled occasionally against the Dolphins in the 2000s before reasserting dominance in the 2010s. 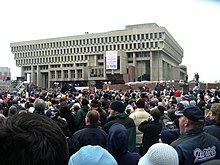 The Patriots and Dolphins are the only two teams in the Super Bowl era to post undefeated regular season records, with Miami going 14-0 in 1972 and the Patriots going 16-0 in 2007. Notable moments between the clubs include the Snowplow Game, three playoff matchups, and the Dolphins revealing their Wildcat offense against the Patriots. The Patriots have had 14 coaches through their history. 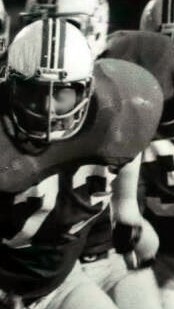 Their first coach was Lou Saban, who coached them to a 7–12–0 record in 1960. Bill Belichick has the longest term as head coach with the Patriots. ↑ "The History of the New England Patriots". Patriots.com. NFL Enterprises, LLC. Retrieved August 8, 2018. ↑ "The Evolution of the Patriots Logo and Uniform". Patriots.com. NFL Enterprises, LLC. Retrieved August 8, 2018. ↑ "New England Patriots Team Capsule" (PDF). 2018 Official National Football League Record and Fact Book. NFL Enterprises, LLC. August 9, 2018. Retrieved November 21, 2018. ↑ "New England Patriots Team Facts". Pro Football Hall of Fame. November 5, 2015. Retrieved November 5, 2015. 1 2 Palma, Briana (April 22, 2015). "How much do you know about the Patriots?". Patriots.com. NFL Enterprises, LLC. Archived from the original on November 15, 2015. Retrieved November 5, 2015. 1 2 3 4 5 6 7 8 "Historical Dates – Patriots History". New England Patriots. August 28, 2015. Archived from the original on June 6, 2015. Retrieved November 5, 2015. ↑ "#3 New England Patriots". Forbes. September 2, 2011. Retrieved October 9, 2009. ↑ "NFL Team Valuations". Forbes. September 2, 2011. Retrieved October 9, 2009. ↑ Badenhausen, Kurt (September 7, 2011). "The NFL's Most Valuable Teams". Forbes. ↑ Badenhausen, Kurt (July 18, 2018). "Full List: The World's 50 Most Valuable Sports Teams Of 2018". Forbes. Retrieved August 26, 2018. ↑ "13 NFL teams that came closest to unbeaten regular seasons". USA TODAY. Retrieved February 8, 2019. ↑ "2012 Super Bowl". National Football League. Retrieved August 24, 2015. ↑ "2015 Super Bowl". National Football League. Retrieved August 24, 2015. ↑ "AFC Championship instant analysis: Patriots pound Steelers to reach another Super Bowll". Fox Sports. Retrieved January 22, 2017. ↑ Hoffman, Benjamin (February 5, 2017). "Here's How the Patriots Won Their Fifth Super Bowl". The New York Times. ISSN 0362-4331. Retrieved February 7, 2017. ↑ Acee, Kevin (February 5, 2017). "Patriots win wild, historic Super Bowl". sandiegouniontribune.com. Retrieved February 6, 2017. ↑ "Peter King's Monday Morning QB: SB52—Pats v Eagles". SI.com. Retrieved February 6, 2019. ↑ "Super Bowl LIII - Los Angeles Rams vs. New England Patriots - February 3rd, 2019". Pro-Football-Reference.com. Retrieved February 8, 2019. ↑ "Patriots tie Steelers with 6th Super Bowl win". Pittsburgh Post-Gazette. Retrieved February 8, 2019. 1 2 Sessler, Marc (July 3, 2013). "New England Patriots debut new, bolder logo". National Football League. Archived from the original on September 10, 2015. Retrieved August 29, 2015. 1 2 3 4 5 6 7 "Patriots' Uniform Evolves From Flying Elvis Over The Years". NESN. July 20, 2013. Retrieved August 24, 2015. ↑ Lukas, Paul (July 28, 2011). "The untold story behind the Patriots logo". ESPN.com. Retrieved January 24, 2018. 1 2 3 4 5 "History of NFL Uniforms: New England Patriots". National Football League. Retrieved August 26, 2015. 1 2 3 4 5 6 "Evolution of the Patriots' Uniform". National Football League. Retrieved August 26, 2015. ↑ "New NFL Safety Rule Forbids Alternate Helmets". Bleacher Report. September 18, 2013. Retrieved August 26, 2015. ↑ Fiske, Angelique (September 13, 2016). "Check out the 2016 Patriots Color Rush Jerseys". New England Patriots. Retrieved September 24, 2016. ↑ Mullen, Logan (October 5, 2018). "Bill Belichick's Level Of Interest In Color Rush Uniforms Is About What You'd Expect". NESN.com. Retrieved February 8, 2019. ↑ Bisman, Neil (October 17, 2013). "History Fuels Rivalry Between Jets and Patriots". NBC New York. Retrieved January 2, 2014. 1 2 Kevin W. Ryan (September 10, 2013). "The 10 Best Moments of the Jets-Pats Rivalry". Bleacher Report. Retrieved January 2, 2014. ↑ "'Very rare' performance by Tom Brady reflects his greatness". ESPN.com. Retrieved October 28, 2015. 1 2 3 4 5 6 "Boxscore finder: Baltimore/Indianapolis Colts vs New England Patriots". Pro Football-Reference. Sports Reference LLC. Archived from the original on September 7, 2015. Retrieved August 24, 2015. ↑ "New England Patriots vs. Indianapolis Colts - Recap - November 4, 2007". ESPN. Archived from the original on February 23, 2011. Retrieved March 22, 2014. ↑ "Indianapolis Colts at New England Patriots - November 18th, 2012". Pro-Football-Reference.com. Retrieved December 28, 2017. ↑ Domonoske, Camila (January 18, 2015). "New England Beats Indianapolis 45-7 In AFC Championship : The Two-Way". NPR. Retrieved January 28, 2015. ↑ "Buffalo Bills vs. New England Patriots Results - The Football Database". FootballDB.com. ↑ "2017 Buffalo Bills Rivalry Survey". www.allcounted.com. ↑ "New Bills coach Rex Ryan says Patriots still his top target - The Boston Globe". BostonGlobe.com. Retrieved August 3, 2017. ↑ Kenyon, David (October 30, 2018). "Tom Brady has more wins in Buffalo since 2001 than any Bills QB". Sportsnaut.com. Retrieved February 4, 2019. ↑ "New England Patriots vs. Miami Dolphins Results | The Football Database". FootballDB.com. Retrieved August 28, 2017. ↑ "Dolphins stun Patriots 38-13". The Seattle Times. September 22, 2008. Retrieved August 28, 2017. ↑ "New England Patriots vs. Baltimore Ravens 12/03/2007". National Football League. Retrieved August 27, 2015. ↑ "Baltimore Ravens vs. New England Patriots 10/04/2009". National Football League. Retrieved August 27, 2015. ↑ "2009 Wild Card Round: Baltimore Ravens vs. New England Patriots". ESPN. Retrieved August 27, 2015. ↑ "Baltimore Ravens vs. New England Patriots 10/17/2010". National Football League. Retrieved August 27, 2015. 1 2 3 4 "2012 AFC Championship Game Rapid Reaction". ESPN. January 22, 2012. Retrieved December 9, 2013. ↑ "Torey Smith's brother dies in a motorcycle crash". USA Today. September 23, 2012. Retrieved December 9, 2013. ↑ "New England Patriots at Baltimore Ravens - September 23rd, 2012". Pro-Football-Reference.com. Retrieved December 30, 2017. ↑ "Bill Belichick to receive fine Wednesday for grabbing referee". National Football League. September 26, 2012. Retrieved December 9, 2013. 1 2 3 Golen, Jimmy (January 20, 2013). "Ravens Win AFC Championship Game, Hold Off Patriots in Rematch to Reach Super Bowl". The Huffington Post. Archived from the original on January 24, 2013. Retrieved January 11, 2014. ↑ "Baltimore Ravens vs. New England Patriots – Box Score – January 10, 2015". ESPN. Retrieved August 24, 2015. 1 2 3 "Patriots Cheerleaders and Appearances". New England Patriots. Archived from the original on September 9, 2011. Retrieved January 1, 2014. ↑ Josh Pahigian (December 13, 2007). "It's a Celebration: Best NFL Touchdown Rituals". ESPN.com. Retrieved February 19, 2019. ↑ "The Crazy Train That Led To Patriots Introductions - Lou Imbriano". louimbriano.com. Retrieved February 6, 2019. 1 2 3 "Sports". Gillette Stadium. Archived from the original on March 2, 2014. Retrieved March 2, 2014. ↑ Zhang, Benjamin. "Check out the New England Patriots' Boeing 767 private jet that flew the team to Super Bowl LIII". Business Insider. Retrieved February 6, 2019. ↑ "New England Patriots Career Passing Leaders". Pro Football Reference. Archived from the original on September 19, 2015. Retrieved August 27, 2015. ↑ "New England Patriots Career Rushing Leaders". Pro Football Reference. Archived from the original on September 9, 2015. Retrieved August 27, 2015. ↑ "New England Patriots Career Receiving Leaders". Pro Football Reference. Archived from the original on September 21, 2015. Retrieved August 27, 2015. ↑ "New England Patriots Career Scoring Leaders". Pro Football Reference. Archived from the original on November 5, 2015. Retrieved November 18, 2015. ↑ "New England Patriots All-Time Coaching Wins". Pro Football Reference. Archived from the original on August 20, 2015. Retrieved August 27, 2015. ↑ Borges, Ron (September 1, 2000). "Coming to terms with the system". The Boston Globe. Archived from the original on October 18, 2000. Retrieved October 6, 2009. ↑ Guregian, Karen (January 15, 2009). "Scott Pioli starts life as lone boss in Kansas City". Boston Herald. Archived from the original on September 21, 2012. Retrieved October 6, 2009. ↑ Long, Mark (February 6, 2005). "Versatile Vrabel vaults into Super Bowl lore". San Diego Union-Tribune. Archived from the original on December 26, 2008. Retrieved October 6, 2009. ↑ Bell, Jarrett (January 24, 2005). "Patriots all about the rings". USA Today. Retrieved October 6, 2009. ↑ "The Hall at Patriot Place". New England Patriots. Retrieved June 3, 2013. ↑ "Ben Coates elected to Patriots Hall of Fame". New England Patriots. July 7, 2008. Archived from the original on December 8, 2008. Retrieved July 8, 2008. ↑ "The Hall at Patriot Place Presented by Raytheon Hall of Fame!". New England Patriots. Archived from the original on February 5, 2005. Retrieved June 14, 2010. ↑ "Patriots Hall of Fame Senior Selection Committee formed". New England Patriots. March 25, 2011. Archived from the original on September 5, 2012. Retrieved March 27, 2011. ↑ Finn, Chad (March 24, 2009). "Sullivan inducted into team's Hall". The Boston Globe. Archived from the original on March 28, 2009. Retrieved March 24, 2009. ↑ "Pats honour the past". Regina Leader-Post. Retrieved February 8, 2019. 1 2 3 4 "Patriots Anniversary Teams". New England Patriots. Archived from the original on December 6, 2008. Retrieved March 30, 2009. 1 2 "Patriots All-Decade teams announced". New England Patriots. March 31, 2009. Retrieved April 25, 2016. ↑ "New England Patriots Coaches". Pro-Football-Reference.com. Retrieved February 8, 2019. ↑ Pedulla, Tom (September 12, 2007). 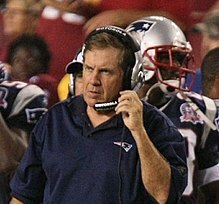 "Belichick apologizes for 'Videogate'". USA Today. Retrieved January 18, 2008. ↑ "Jets play innocent, wonder 'What is 'Spygate?'". Associated Press. MSNBC.com. December 10, 2008. Archived from the original on January 13, 2008. Retrieved January 18, 2008. ↑ Reiss, Mike (September 13, 2007). "Final ruling". The Boston Globe. Archived from the original on October 11, 2008. Retrieved February 18, 2018. ↑ "NFL was ready to check New England Patriots' footballs against Colts, report says - Newsday". Newsday. Retrieved May 6, 2015. ↑ "Report: Colts Raised Concerns About Under-Inflated Balls After Game vs. Patriots in Indianapolis". Boston.com. Retrieved May 6, 2015. ↑ McLaughlin, Eliott (January 23, 2015). "What the heck is Deflategate anyway?". CNN. Retrieved January 23, 2015. 1 2 Wells Jr., Theodore V. (May 6, 2015). "INVESTIGATIVE REPORT CONCERNING FOOTBALLS USED DURING THE AFC CHAMPIONSHIP GAME ON JANUARY 18, 2015" (PDF). National Football League. Retrieved May 7, 2015. ↑ "On the Wells Report". American Enterprise Institute. Retrieved August 10, 2017. ↑ "Tom Brady's four-game suspension upheld". ESPN. April 25, 2016. Retrieved April 25, 2016. ↑ "Super Bowl LI - New England Patriots vs. Atlanta Falcons - February 5th, 2017". Pro-Football-Reference.com. Retrieved December 10, 2017. 1 2 3 4 5 6 7 8 "Patriots Game Broadcast Information". Retrieved February 5, 2019. ↑ "BBGI Brands". Beasley Broadcast Group. Retrieved February 5, 2019.